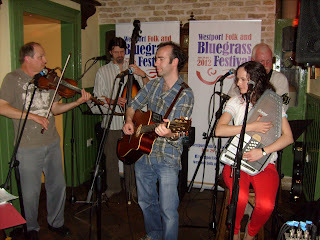 The organising team of the 6th Westport Folk and Bluegrass Festival in Co. Mayo, in the west of Ireland, held the official launch party on Friday 25 May in McGing's pub, Westport. The full house were treated to music by Mayo's top bluegrass band, the Rocky Top String Band (below), who have played every Westport festival so far and will open this year's event (29 June-1 July) with a show at the Clew Bay Hotel. The full festival programme includes two North American bands and the acclaimed Thunderbridge Bluegrass Boys from Britain. The festival enjoys the generous sponsorship of local businesses and venues, of the local government authorities in Mayo and Westport, of Discover Ireland, and - this year - the national Arts Council. More details are on the Bluegrass Ireland Blog.